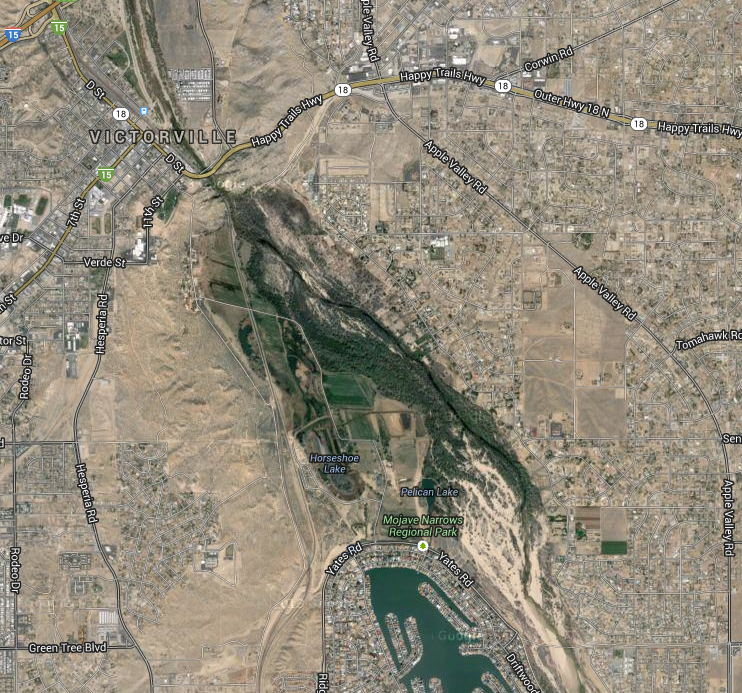 And that is the last bit of surface flow in the Mojave River after coming off Deep Creek before it goes underground. Does not look very good for a beaver? No riparian corridor but Lawrence of Arabia amounts of sand. Until the river does something miraculous and resurfaces about 8 miles downstream at Mojave Narrows Regional Park where a confluence of geology forces the water back up. 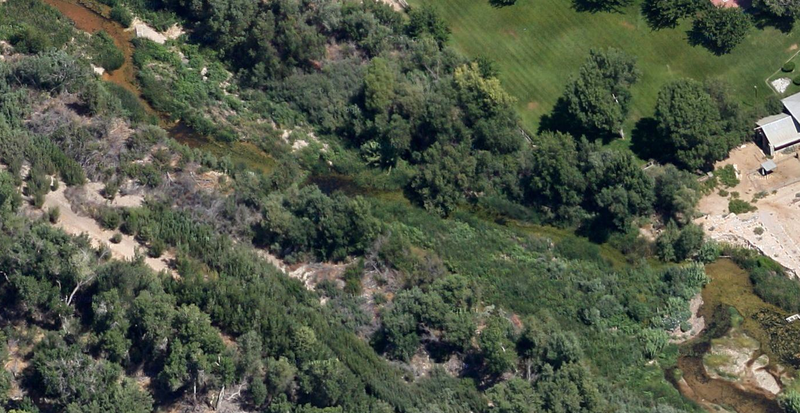 And discovering this amazing desert oasis are beavers from the nearby San Bernardino mountains where several translocations took place last century. And they seem to like the desert. Victorville looks like a veritable haven for beavers smack dab right in the middle of one of the most well known deserts in the world. Look at that big body of water, the whole pond is about 750 feet long!! 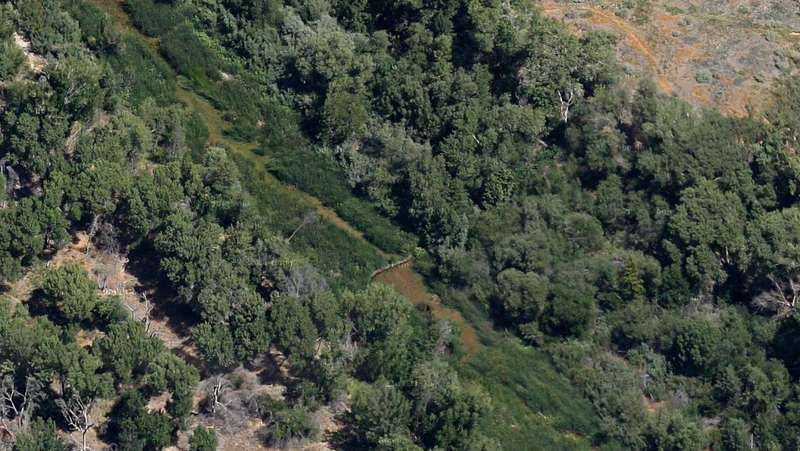 You can actually back up and see the swath of riparian green - largely created by the beavers - contrasted sharply against the desert from outer space!! Beaver can attenuate waning surface flows and even more substantially increase subsurface flows. A little bit after Victorville the river submerges underground again and the river become a wide sandy wash as pictured below. So pretty cool little desert population of beaver. 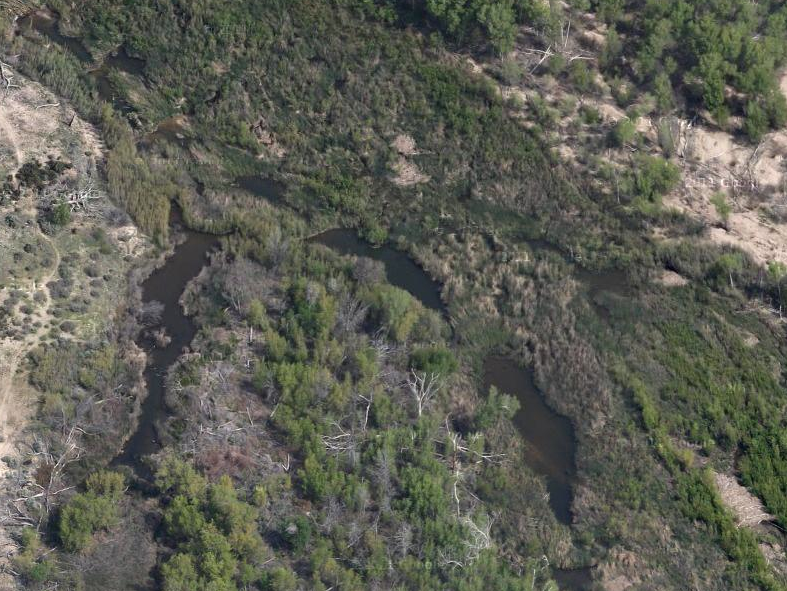 In the areas with surface flows the beaver have found them and greatly augmented the habitat for plants and wildlife, and deepened and widened the channel for more persistent year round flows and groundwater percolation. The Mojave River is a noted habitat for several endangered reptiles and amphibians - especially western pond turtles - and doubtless multitudes of bird species. Unfortunately the lone native fish - The Mojave Tui Chub - has more or less been pushed to the brink of extinction by its non - native introduced relative the Arroyo Chub. Interestingly the Mojave Tui Chub is an ice age holdover from when the Mojave river used to flow into a permanent lake so beaver would have likely benefited this fish as they prefer slow moving, lentic waters. Like antediluvian salad on facebook. Watch me on Deviantart @NashD1.Subscribe to my youtube channel Duane Nash. Duane, I really enjoy your pictures of the great work beaver are doing in the desert. It is so important for the wildlife decision makers to start treating beaver like the keystone species that are instead of vermin. Your work is going along way to helping the public understand the benefit of beaver which will sway wildlife policy makers. Thanks for a well written article! The Eel just developed a dry stretch at Fortuna this past week. This won't be good for the salmon if we don't get rain. This is a good article, Duane. 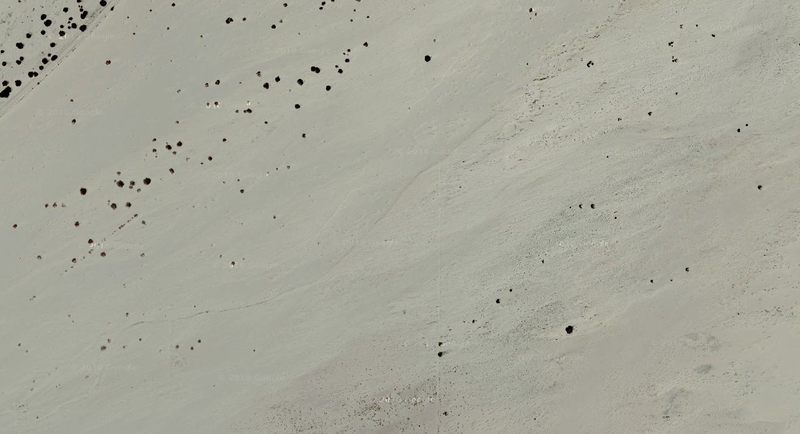 Nice use of mapping and sat photos. "Spruce beetle and mountain pine beetle outbreaks have impacted millions of acres of conifer forest from Alaska to northern Mexico"..........."These species are native to North America, and periodic outbreaks have shaped the structure and composition of conifer forests for millennia"................ "To characterize the response of a suite of mammalian species to beetle‐induced changes in vegetation in the southern Rocky Mountains, Colorado Parks and Wildlife(WPS) deployed cameras at 300 randomly selected sites during summer 2013–2014"............. . "Ungulates(deer, elk, moose) generally exhibited a positive association with bark beetle outbreaks"............ "Elk were positively associated with severity, but not a decade after outbreak.........."Mule deer exhibited the opposite relationship"............."Moose used forest stands adjacent to preferred willow habitat, peaking3–7 yr after an outbreak commenced, but only in high severity locales"............"Black bears, American marten, snowshoe hares, and porcupines did not appear to be substantially influenced by beetle activity"............"Red fox use was positively associated with beetle stands after a decade, but overall use declined as severity increased"............."Red squirrel use declined in severely impacted stands, likely as a response to diminished cone crops".................."Golden‐mantled ground squirrels and chipmunks exhibited a shallow negative relationship after a decade passed as did coyotes"
Is a beaver just another dumb animal? Fox Creek Beaver Reintroduction - Our goal is reintroduction of a sustainable beaver population in the riparian zone. 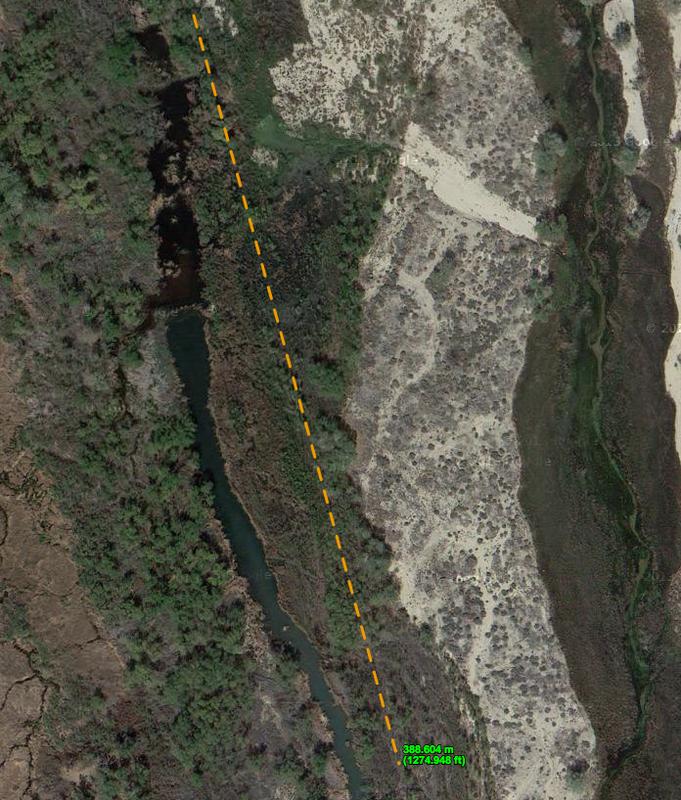 Do Drought Prone Beaver Populations Aestivate?